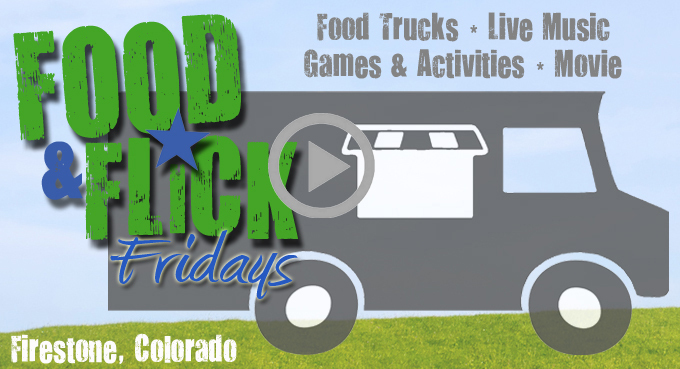 Food Trucks: 6 to 9 p.m.
Live Music: 6 to 8 p.m.
Activities & Games: 6 to 8 p.m.
Movie Starts at Dusk: 8:30 p.m.
All food trucks have been confirmed and booked for the 2019 Food & Flick Friday events. Booth vendors will be limited to 3 vendors for each event. Spaces for booth spaces will be 20’20’. Vendors should have an activity for our event attendees during the event. Please note these spaces are for community engagement, no items may be sold in these spaces. $20 per event. Event date selections to be approved by Events & Programming Coordinator before payment can be processed. Vendor application deadline is Friday, May 3, 2019, 5:00 p.m. Complete an application online here. Food & Flick Fridays in Firestone have become the premier summertime fun event. Bring your lawn chairs, blankets, friends and family for a fun Friday night. Event attendees are welcome to start the evening by enjoying scrumptious fare from a variety of full-fledged mobile restaurants set up from 6 to 9 p.m. In addition to the food trucks, the events will include various activities from 6 to 8 p.m. including live music, free face painting, games and activities. Select sponsors of the series will also be set up in the park with fun activities planned at each of their booths. Free movies will show on the big screen starting at 8:30 p.m.